Acupuncture Toronto - Does It Really Work? Acupuncture Toronto – Does It Really Work? Note: if you’re just looking for a list of acupuncturists, click here. Originating in China and one of the most ancient forms of Traditional Chinese Medicine (TCM), acupuncture treats the whole person. And the good news is that if you’re interested in acupuncture, Toronto offers many knowledgeable, professional, highly trained practitioners to choose from. As eloquently stated by Plato, the true essence of holistic forms of medicine like acupuncture is seeing you, the patient, as a multi-faceted being. It’s also about realizing that whatever symptoms might be present, whether you have throbbing low-back pain, extreme PMS symptoms, overwhelming stress or chronic insomnia, these are signs from your body that something on the base level is not right, and must be addressed. Simply stated: Acupuncture gets to the root cause of each symptom, and treats you on multiple levels. Before digging deeper into the history of acupuncture and specific conditions it can help you with, let’s take a look at some of the many benefits of this ancient form of traditional medicine. Incredibly effective for pain relief, without the potentially harmful side effects of drugs. Ability to treat multiple acute and chronic conditions. Gets to the root of the problem, instead of just treating the symptoms. Considers all components essential to health including emotional, spiritual, physical, and psychological factors. Strongly supports disease prevention in the short and long term. Manages stress and related problems, such as anxiety and insomnia. Encourages the body’s natural healing processes. These are just several of the many benefits you get from acupuncture. From heart disease to acupuncture for weight loss, this ancient TCM modality works to support your body on the base level and treat multiple symptoms and conditions. Again, acupuncture can be effective in treating these and many other conditions, particularly when combined with other forms of Traditional Chinese Medicine, such as moxibustion, cupping therapy, dietary changes and herbs, all of which we will dig into more in depth later on in this article. So, What Exactly Is Acupuncture? Acupuncture needles with moxa sticks, lavender petals, ginger and herbs. To fully understand how an acupuncture treatment works on all of the root levels mentioned above, we must set aside some of our western ideas of what medicine is. That’s not to say that acupuncture can’t also be explained by scientific and medical principles. But it also works on energetic levels to promote our body’s own amazing processes of natural healing. Acupuncture is a system of medicine that uses extremely fine needles to stimulate precise acupuncture points all over the body and promote natural healing. Fascia is the body’s system of connective tissue, primarily made up of collagen. Fascia is essentially a band that is located underneath the skin and connects the entire body, working to protect vital organs and stabilize muscles and joints. Acupuncture and TCM view your body as the whole, intricate entity that it is, connected via fascia, and one that must be treated as a system of parts working together to create and sustain health and life. Qi (pronounced chee), is the word used more or less to mean energy, and refers to your body’s vital blood and body fluids that are essential for wellbeing. According to shen-nong.com (named after a 25th century Chinese legend), in ancient TCM, it was believed that qi was responsible for everything in the entire universe, and that change, disease, etc was all due to its movement. We can think of the Chinese medicine term meridian, meaning channels of energy, as representing the fascial system, which explains why your acupuncturist can insert a needle in your foot to support digestion. Fascinatingly, when an Acupuncturist inserts a needle, a strong nerve reaction occurs that sends a message to your brain. Depending on where the point is located and what your condition is, the message sent might correspond with digestion, respiration, pain, sleep, anxiety, and so on. Because of this interconnected web of fascia tissue (thus the interconnectedness of the human body as a whole), acupuncture points (of which there are 361) can correlate with symptoms, disease and healing all over our body. When the brain receives the message from the nerve centers stimulated by acupuncture needles, energy is sent to that particular “trouble zone,” and healing occurs. In order to find out how acupuncture can truly benefit you, it’s helpful to understand a bit about the history and origins of the practice. Interestingly, there is some discrepancy as to exactly where and when acupuncture began being used as a medical modality, as it depends on which ancient texts are cited and what might have constituted acupuncture. The Journal of Rheumatology cites that the first documented and organized system of acupuncture dates back to around 100 BC in China, where silver and gold acupuncture needles were discovered (or thought to be discovered) in the tomb of Liu Sheng, the King of the Western Han empire of China at the time. However, many historians believe that acupuncture was practiced long before this, and that the official documentation found at this time was actually collected from centuries of prior treatment using acupuncture. From ancient Traditional Chinese Medicine practices to today’s modern landscape, acupuncture has become commonly used both in China and across the globe as an accepted, respected, and extremely effective form of medicine. It is also used alongside massage, dietary changes, Chinese herbs, moxibustion and cupping (practices used together with the goal of moving stagnant blood). 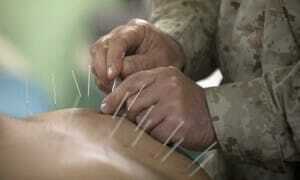 Even the US Navy uses acupuncture. The modality of acupuncture was developed long before modern science came about, under a very different medical paradigm. And measuring its effectiveness using modern-day medical research and studies proves highly difficult. Pain reduction is an area where acupuncture has been most proven to help, under the western model. Again, the main goal and method of acupuncture is to promote your own innate internal healing, and it is a process. For some, acupuncture will have immediate effects (within one or two treatment sessions), and for others, the effects will take place over a longer period of time. Many factors are at play, such as the condition being treated, other modalities used in conjunction with needling, the specific treatment plan, and more. The bottom line is that acupuncture has been effectively used to treat a myriad of symptoms and conditions for centuries, and has been healing people just like you. This is a common concern in acupuncture treatments, being that the modality works primarily with needles. However, acupuncture needles are incredibly thin, and usually cannot even be felt as they are inserted into your skin. Certain points might feel tender at first, but any needle that induces pain for more than a few seconds should be removed by your practitioner and readjusted. One last note is that the depth and aggressiveness with which an acupuncture needle is inserted also depends on the particular style and tradition. For example, Japanese acupuncture is known for a much softer and more surface-level insertion, whereas traditional Chinese acupuncture calls for a more aggressive and deeper insertion. Overall, an acupuncture session is a relaxing experience, and pain is quite minimal. 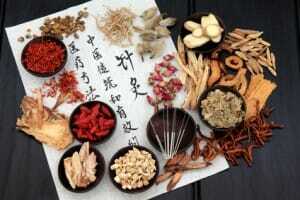 Depending on the practitioner, specific Chinese herbs are often used in correlation with acupuncture treatments. 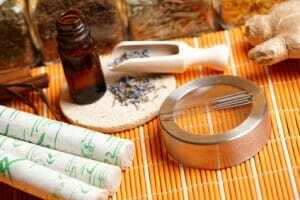 TCM Practitioners are especially trained in herbals within the realm of acupuncture in Toronto. Within Chinese herbal medicine, over 300 herbs are used to treat the many conditions discussed previously in this article. The ancient practice of cupping is often used with acupuncture needling, and involves heat and glass cups used in different areas of the body. It uses suction to move the blood and release stagnation, therefore promoting healing. Moxa is an incense stick made of the dried herb mugwort. For moxibustion, it comes in the shape of a cone, and is burned and used either on or near the skin, also with the end goal of moving stagnant blood. This practice is also a part of ancient Traditional Chinese Medicine practices, but is less invasive than acupuncture. Using many of the same points, acupressure simply involves manual pressure, and is a form of focused massage. This practice is newer, and involves connecting your acupuncture needles to a device that delivers a continuous electrical pulse, with the result of further stimulating the nerve centres that send the message to your brain. This form of acupuncture is thought to be particularly useful when you have a major qi blockage or stagnation. Who Practices Acupuncture In Toronto? In considering where to go for acupuncture, Toronto offers various options of qualified professionals. Within Canada, Traditional Acupuncturists are regulated in the provinces of Ontario, British Columbia, Quebec, Alberta and Newfoundland. This means that any practitioner of acupuncture must be properly trained and licensed in order to use acupuncture as part of their practice. In Toronto, acupuncture patients have the choice of receiving their treatments from a TCM Practitioner, Naturopathic Doctor (ND), Chiropractor, Physiotherapist, Medical Doctor (MD), or even Registered Nurses (RN). Each professional will have a slightly different focus and knowledge base due to their education, and it’s up to the patient to decide what’s best for them. A Toronto Naturopath often receives a similar education to that of a TCM Practitioner, except that the latter might offer you more experience and training in working with Chinese herbs (again, depending on their education). A Chiropractor or Physiotherapist you would likely visit for musculoskeletal issues and treatment/prevention of injury, and will probably not have as much training in pulse and tongue diagnosis, for example (two practices often used within a TCM acupuncture exam). If you’re looking for acupuncture, contact our receptionist at 416-792-4400 or by using the form below and she will book you for a FREE 15-minute phone or in-person consultation with one of the above practitioners.